Spencer, Emily and Hannah are standing around talking. Emily ask of Toby found out what was in the barrel. Spencer says she doesn’t know and even if Toby did know he wouldn’t tell her. Aria ask if Spencer and Toby are ok. Spencer tells them her and Toby are a far removed from ok. Emily tells her she is sorry. Spencer says she understands why Toby joined the police force and it seems like now her and what’s going on is tearing him apart. Aria turns and sees Spencer’s mom. Emily says if she is working on a Saturday it must be serious. Spencer explains her mom is a consultant in Ali’s case. Aria ask her why. Spencer says it’s because her mom what’s to know what they know. Aria ask such as. Emily says who gets called to testify. They watch as one of Alison’s lawyers gives Spencer’s mom a folder. Spencer looks across the street and sees Hannah. Spencer ask them to wish her luck. Aria and Emily are alone and Aria ask if EzrA is in the coffee shop. Emily tells her he is in Harrisburg for the weekend. Aria acts like she knew. Emily isn’t buying it. Spencer wants to apologize to Hannah. Hannah tells her she was right. Spencer is surprised. Hannah admits it was a bad idea trying to get the stuff out of the storage space. Hannah tells Spencer she just panicked. Spencer and Hannah head over to Aria and Emily. Aria ask if they are good. Spencer says they are. Emily says maybe not so good. They all turn and look and see Holbrook is back. Spencer thinks he is there to finish the job for Alison. Emily ask why Alison would have him out in the open when he was doing such a good job hidden. Spencer doesn’t have a answer. Back in the coffee shop Aria wants to know why Holbrook is back. Emily seems to think its so he can scare them without doing anything. 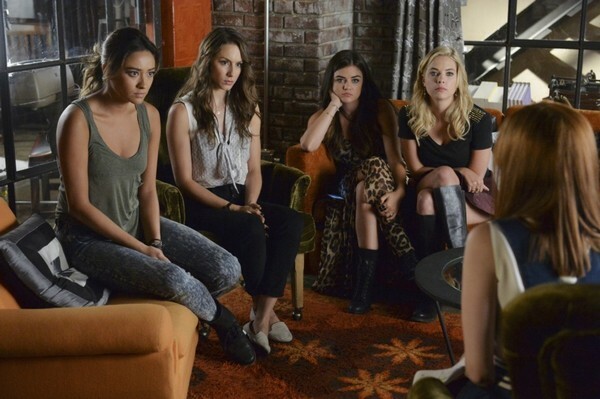 The girls are discussing the Holbrook dilemma while Emily is distracted by watching Talia. Emily leaves to talk to her. Spencer is confident Alison is going down. Hannah takes a,call,from Caleb. Johnny comes in and Spencer finds out he is doing some work for EzrA. He offers to let Spencer help him build it. Spencer declines she is busy. Johnny tells her in that case she will never know what it does. Spencer is about to ask a question but Hannah comes up and says they need to talk. Spencer heads off with Hannah. Emily is in the back with Talia. Emily beings up her missing work and ask if she is ok. Talia tells her she wasn’t sick she just needed to take care of something. Emily stands there for a minute and then walks away. Talia looks after her. Hannah tells Aria and Spencer the police want to reinterview Caleb about the storage space. Hannah says they want to know if he saw anyone acting suspicious. Aria pops up with a besides you. Hannah tells her she isn’t helping. Hannah says she knows she is next on the list to play twenty questions. Hannah’s phone rings. Spencer tells her to answer it. Emily ask the girl who walks up to the counter what she would like to order. The girl tells her she is actually there looking for a Hannah Marin. Emily ask her why. The girl tells her that Mrs. Vanderwaal said she would find her there. She tells Emily her names is Leslie and she was a friend of MonA’s. So she is Leslie from Thanksgiving? Indeed she just said so herself. She said she was with her mom when they called. Leslie says they didn’t say she was dead. Spencer ask if she knew MonA along time. Leslie tells her she met MonA a few summers ago at her grandparents place. Emily points out she wasn’t at the memorial service. Leslie tells her she had exams and a professor who won’t reschedule for anyone or anything. Leslie says she is just there for the weekend. Leslie thanks them for being there for Mona’s mom when she couldn’t be. Spencer is on the phone with Hannah telling her they need to keep a eye on Leslie. Hannah wonders if Leslie could be telling the truth. Spencer says sure but the last time that happened it was CeCe. Spencer wants Hannah to go to MonA’s. Hannah reminds her she is at the police station. Spencer hangs up with her when she spots her moms satchel. She opens it takes out Alison’s file and gets a quick picture of something inside of it with her phone. She heads her mom coming and quickly puts everything back the way it was. Spencer grabs a book and sits down on the couch. Spencer brings up Holbrook. Veronica tells her not to worry about Holbrook. The she walks over with Spencer’s acceptance letters. Spencer doesn’t really want to go to college. Her mom is not cruising past that anytime soon. Veronica makes it clear of she wants to stay out of Alison’s trial she will go to college. Spencer runs upstairs. Hannah is sitting with Caleb. She lets him know her mom will be there in a few minutes. Caleb ask how her mom is. Hannah tells him she doesn’t need this. Hannah is worried the cops have a copy if the tape that A used to lure Spencer and Aria into the freezer. Caleb tells met they will worry about that when they have to. Then he tells her he blocked all their computers so it can’t happen again. They hear Holbrook yelling. Then he comes storming out he grabs some stuff on his desk and heads out the door. He passes Caleb and Hannah on the way. He says it’s perfect just perfect and then he heads out. Spencer heads to aria’s with her snapped picture. Turns out that Aria’s little brother paid Alison a visit. Aria is in straight up denial. Aria insist there is a good explanation. Spencer tells her she needs to get it. Hannah tells Emily that Holbrook got suspended for inappropriate behavior. Emily ask what kind. Hannah looks around and tells her to take her pick. Hannah says it’s because they think he tampered with Alison’s lie detector test. Hannah says it’s the straw that broke the chameleons back. It’s camel Hannah. Hannah says she thinks Holbrook blames them for what happened. Hannah tells Emily to let Aria and Spencer know she is headed off to come Leslie. While making her calls she sees Johnny chatting up Talia. Mike is watching a old movie. Aria walks in and ask what up with that. Mike tells her MonA had a list of old movies she wanted him to see and he thought he would watch a couple. Aria ask how it’s going. He tells her ok. Mike says MonA remembered every detail of every movie she ever saw. That is totally a clue to something. Aria says she was smart. Mike says to smart. Mike goes back to his movie and Aria leaves. Mike looks down. Hannah is spending quality time with Leslie. She picks up a book which no doubt will also serve as a important plot point. She tells Hannah MonA loved that book. Hannah points out they weren’t exactly besties with MonA at the end. Leslie says she knows but they were all precious to MonA just the same. Leslie says MonA was thinking every second. Then boom Hannah remembers something and it’s flashback time. MonA is reading to Hannah out of the book. She puts the book away and tells Hannah she has three wishes and she ask her what she wants. Hannah says MonA makes better wishes. MonA says she would wish for a stop watch so that everything freezes and you would have all the control and no one would ever know it was you. They wouldn’t even know they were being controlled and that would be the best part. Flashback over. Hannah tells Leslie MonA was always thinking. She just was thinking what they thought she was thinking. Emily gets something dome from a shelf and Talia is more than happy to tie her apron back on for her. Emily thanks her and Talia tells her not to mention it. She leaves. Mike walks up to Johnny and ask him what he is making. Johnny tells him it’s a machine that is powered off of secrets. Mike tells him there a lot of those around here. Johnny tells him he has noticed. Hannah walks in with Leslie. Mike sees them and freaks out because Leslie has Mona’s book. He throws a fit. Hannah promises to make sure it goes back where it belongs. Mike leaves. Hannah apologizes to Leslie. Them Leslie drops the bomb that the night before she does she was talking to her on the phone and she hears someone tell her to get get off the phone and pay attention to them. Leslie says she is pretty sure it was Mike. Hannah looks worried. Emily finds Caleb in the park. He is doing homework. Emily is watching Talia and Caleb watches Emily watch Talia. Emily sits down next to Caleb. Emily tells him that Ali is going on trial for murder and she is trying to take them all down with her yet all Emily is thinking about is rather or not Talia is flirting with her. Caleb ask her if she wants the answer to be flirting or not flirting. Emily tells him she doesn’t know, that she knows what she wants but yet doesn’t know what she wants. Caleb tells her that makes perfect sense to him. Emily ask how a anybody gets together with anybody. Caleb tells her to look at everything logically and then flip a coin. Emily smiles. Hannah told Aria what Leslie said about the phone call. Hannah tells her it probably didn’t mean anything. Aria clearly at the point of breaking lets the Mike went to visit Alison in jail thing slip. Hannah says he did what now. Aria tells her Spencer found out. Hannah wants to know if she talked to Mike. Aria says she couldn’t get the words out. Hannah tells her talk or no talk she needs to figure out what going on with Mike. Spencer is with Johnny. She ask him if he is going to tell her hat that thing does. He tells her she is smart and can figure it out. Spencer tells him she doesn’t want to figure it out she just wants to know. Johnny tells her to analyze her sentence it’s very revealing. Spencer says it’s a gelato maker. Johnny smiles at tells her she is right that’s what it is. Spencer laughs and tells him to shut up. Spencer sees he drew his diagram on a missing poster. Spencer ask where he got it. Johnny tells her it was in the barn. Johnny ask her how you go from that to sitting behind bars. Spencer says it’s complicated or maybe it’s simple and they made it complicated. Johnny ask her for a screwdriver. Leslie told Hannah maybe she shouldn’t have told Aria about Mike. Hannah says Aria has a right to know. Leslie doesn’t want to get him in nay trouble. Hannah tells her Mike will be ok. Leslie says she is going to go help Mona’s mom with her tea. Hannah has another flashback. She wakes up next to MonA. Hannah tells her the thing with the stop watch is she would get older while everyone else stayed the same. MonA tells her she would fix that. MonA says she would make it so they would be the ones getting older. Hannah points out they would notice she was still young. MonA tells her that’s there problem. Hannah says what if Alison came back. MonA says if she did it would be to a town full of strangers who forgot about her. Then she would go crazy and they would throw her into Radley. Hannah heads something in the book. She finds a cassette tape in the spine of it. Hannah gets in her car and someone follows her in theirs. Aria is writing in her diary when she sees mike leaving. She grabs a coat and follows him, Johnny is finished building his contraption. Spencer ask him to finally tell her what it does. Johnny has her sit down and put her elbows in to the holes on the table. Then he has her cup her ears. Johnny runs over to the glass sphere and starts talking and Spencer can hear him. Spencer is impressed. Spencer tells him it’s genius. Johnny agrees. Spencer ask him where he came up with the idea. He tells her Rosewood inspired him. Hannah and Caleb listen to the tape. It’s Bethany in Radley talking to her shrink about Alison and she is pissed. She tells him she isn’t the only one who can make plans and she storms out. Caleb suggest they listen to the whole tape and he rewinds it. Mike is standing on a bridge by the water. He takes a bag out of his pocket lays it down and walks away. Aria walks on to the bridge and picks it up. It’s a bag of gumdrops. Aria turns to leave and she sees Mike standing there watching her and he isn’t happy. Mike ask why she followed him. Aria counters by asking why he visited Alison in jail. Mike tells her that none of her business. Aria ask of it was to confront her about MonA. Aria tells him Alison is dangerous even in a cage and to never go back. Mike tells her he isn’t taking orders anymore. Mike tells her he never wants to see her there again. Aria is shocked and says again. Aria ask how many trick or treat bags he has left and who are they for. Mike tells her to be careful going through the woods and leaves. Spencer comes home to her mom working at the kitchen counter. Veronica ask her where she was. Spencer tells her she was helping Johnny. Veronica says she is having second thoughts about him. Spencer tells her not to and that she likes the way his mind works. Veronica thinks Johnny is the reason Spencer doesn’t want to go to college. Spencer nixes that idea. Veronica tells her that her future won’t wait. Veronica’s phone rings and she tells her that they have a match in the blood stains that were in the bin. The blood is Alison’s. Hannah gets pulled over by a empty police car. Hannah grabs the crowbar and walks over to it. Holbrook pops out of nowhere and grabs her. She tells him to let go of her. Holbrook ask her how a girl like Alison becomes a girl like Alison. Hannah tells him she has had years of practice. Holbrook tells her Alison cost him his career. Hannah tells him he could have told Alison no. Holbrook tells her she has him mixed up with the wrong fall guy. He was with some guys from internal affairs and she could ask Tanner to verify it since Tanner knows everything. Holbrook tells her Alison cut him off and then goes to kiss her and Hannah whacks him with the crowbar. She tells him he doesn’t get to play the victim he is the grown up and Alison is just a girl and that if she did cut him off he is lucky. Alison gets in her car and takes off. Talia is looking at Johnny’s machine. Emily offers to show her how it works. Emily goes to the other end and gets in he sphere. She explains to Talia why she could t give her a answer that night. Emily then points out that they really don’t know each other. Emily says she knows what it’s like to be alone and be lonely. Emily leaves the sphere. Talia tells her it took all the courage she had to tell Emily what she did. She tells Emily she was once told to act like you have all the experience and confidence in he world even if you don’t have either. Talia gets up to leave Emily stops her and they end up kissing. Hannah, Spencer, and Aria are wondering where Emily is. Hannah tells them Holbrook is innocent. Spencer says that means someone else has been helping Alison. Hannah and Spencer think it’s Mike. Mike is signing to see Alison. A tag- someone goes into MonA’s room. They grab the book and open the spine. The tape isn’t there. They slam the book down and a doll falls.